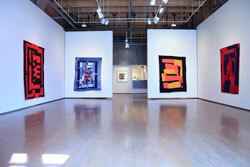 "..Some of the most miraculous works of modern art America has produced. Imagine Matisse and Klee (if you think I'm wildly exaggerating, see the show) arising not from rarefied Europe, but from the caramel soil of the rural South in the form of women, descendants of slaves when Gee's Bend was a plantation. These women, closely bound by family and custom (many Benders bear the slaveowner's name, Pettway), spent their precious spare time -- while not rearing children, chopping wood, hauling water and plowing fields -- splicing scraps of old cloth to make robust objects of amazingly refined, eccentric abstract designs. The best of these designs, unusually minimalist and spare, are so eye-poppingly gorgeous that it's hard to know how to begin to account for them. But then, good art can never be fully accounted for, just described." 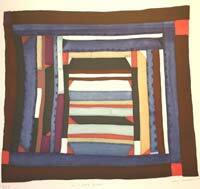 Greg Kucera Gallery is pleased to announce its second exhibition of quilts and related prints by women from Gee's Bend, Alabama. The African American quilters coming from rural hamlets such as Gee's Bend rely on recognizable traditions of patterning but create their own unique riffs as well. These African-American quilts relate to the ongoing tradition of American patchwork quilts in ways similar to how American jazz and rural music forms relate to European classical music. The notes are the same but the rules are altered or loosened. A comparison to music is apt because the quilt makers often refer to church music as a major source of their inspiration, "quilting and singing, singing and quilting." Gee's Bend is a community of about 700, among whom are the descendants of 3 or 4 generations of female quilt makers. Because of the remoteness of its location, Gee's Bend was slow to become known to outside cultural institutions. Albert Rothstein photographed the people of Gee's Bend for the Farm Security Administration in the 1930s. In 1941, The Library of Congress sent Robert Sonkin, speech professor at City College of NY, to record the spirituals and sermons of the area. In 1966, the Freedom Quilting Bee was formed in nearby Rehoboth to allow the women a chance to collectively produce and sell their quilts. A brief contract with Bloomingdale's allowed for a foundation of commercial success but expectations of "consistency" in their products led to disillusionment among the quilters. A 1972 contract with Sears, for corduroy pillow covers, lasted 20 years and provided for long-term improvement in their lives but not in the development of their art, save for introducing corduroy to their quilting. 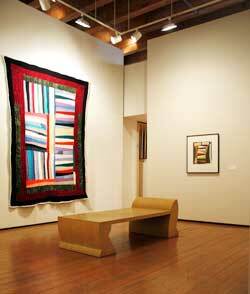 The corduroy quilts are singularly impressive among the host of generally found materials used by these artists. The recognition of the women of Gee's Bend as artists came though contact with travelers to the area and contacts in New York. In 1967, Lee Krasner visited Gee's Bend with her dealer Donald McKinney of Marlborough Gallery. 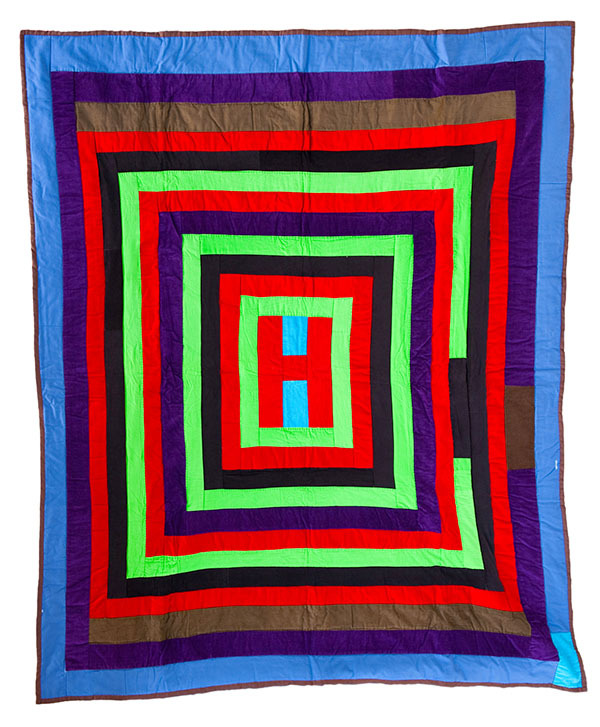 Both bought quilts and slowly, by word of mouth, the reputation of the women of Gee's Bend as quilt making artists grew. In 1999, William Arnett, creator of Tinwood Alliance, brought the quilts to the attention of noted writer and curator Jane Livingston. Her essay, "Reflections on the Art of Gee's Bend" is the centerpiece for the 2002 exhibition catalog produced by the Houston Museum of Fine Arts, for the exhibition which has traveled to the Whitney Museum of American Art; Museum of Fine Arts, Boston; Los Angeles County Museum of Art; Milwaukee Art Museum; and others. "The quilts in the show are no less than the equals-in unconventional color, bold and surprising composition, and subtle visual invention-of just about any abstract painting made by any trained artist living in one of the world's great cities."